Come and join another of our monthly Naturally Singapore Walking Tours. Our very experienced and knowledgeable guide Ed also guides for National Parks and the Singapore Tourist Board and he’ll take us through the historic Bukit Timah Nature Reserve (BTNR) on an approximately 3-hour walk. Time permitting we’ll go “next door” to Hindhede Park to look for colugos (aka, flying lemurs). Please note this walk will be more strenuous than other nature walks so please no children, strollers etc. More info including meeting place will be emailed to those registered a few days before the walk. A mere 12 km from the bustling city centre, this 163-ha reserve is home to a rich and diverse ecological system including around 40% of our nation’s (native) flora and fauna. It also encompasses Singapore’s highest hill, Bukit Timah, which stands at 163 m and retains one of the few areas of primary rainforest in the country. Established in 1883, Bukit Timah Forest Reserve was one of the first forest reserves to be created in Singapore, as recommended by Nathaniel Cantley, the then superintendent of the Singapore Botanic Gardens. In 1882, Cantley was commissioned by the government of the Straits Settlements to prepare a report on the forests of the settlements, in which he recommended that several forest reserves be created on the island. All the reserves, except for Bukit Timah Forest Reserve, were however worked for timber. By 1937, most of these reserves had been depleted due to economic development. 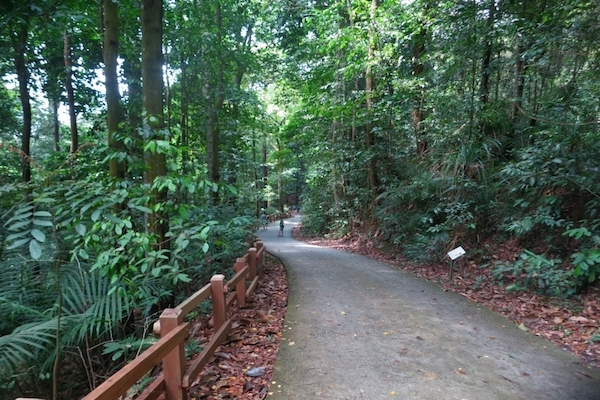 Thankfully, Bukit Timah Forest Reserve was retained for the protection of its flora and fauna under the management of the Singapore Botanic Gardens.